The blending of these types of effects not only helped change the story of the film, but the canon of Star Wars itself. 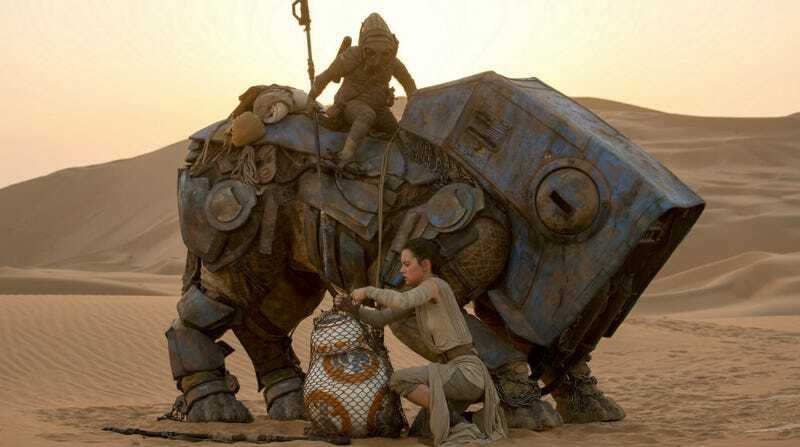 So we talked to Industrial Light and Magic’s Roger Guyett and Patrick Tubach — both visual effects supervisors onThe Force Awakens (Guyett was also the second unit director on the film), both nominated for the Best Visual Effects Oscar this year — to find out how Star Wars might have revolutionised special effects for a third time. One example is a transition in the film’s third act where the Resistance X-Wings had to get from space down to the Oscillator on Starkiller Base. In editing, Abrams and his team realised they didn’t have an interesting transition. Enter Guyett, Tubach and their team. Everyone conceived a quick sequence of the pilots talking to each other as they swooped down to the planet. The problem was, there was no footage of this. And along with all of this is the legacy of Star Wars. It’s unlike anything the world of pop culture and film-making has every seen, and the effects team worked knowing their decisions would have a long-lasting effect.